The stone-carved Zimbabwe Bird is the national emblem of Zimbabwe, appearing on the national flags and coats of arms of both Zimbabwe and Rhodesia, as well as on banknotes and coins (first on the Rhodesian pound and then on the Rhodesian dollar). It probably represents the bateleur eagle or the African fish eagle. The bird's design is derived from a number of soapstone sculptures found in the ruins of the ancient city of Great Zimbabwe. Zimbabwe, officially the Republic of Zimbabwe, is a landlocked country located in southern Africa, between the Zambezi and Limpopo Rivers, bordered by South Africa, Botswana, Zambia and Mozambique. The capital and largest city is Harare. A country of roughly 16 million people, Zimbabwe has 16 official languages, with English, Shona, and Ndebele the most commonly used. The dollar (R$) was the currency of Rhodesia between 1970 and 1980. It was subdivided into 100 cents. It is now the definitive icon of independent Zimbabwe with Matenga (2001)  listing over 100 organisations which now incorporate the Bird in their logo. The Shona are a Bantu ethnic group native to Zimbabwe and neighboring countries. The people are divided into five major clans and adjacent to other groups of very similar culture and languages. This name came into effect in the 19th century due to their skill of disappearing and hiding in caves when attacked. Hence Mzilikazi the great king called them amaShona meaning "those who just disappear." When the white settlers came to Mashonaland, they banned the Shona people from staying near caves and kopjes because of their hiding habits. This explanation is because there is no word called "Shona" in the Shona language vocabulary. There are various interpretations whom to subsume to the Shona proper and whom only to the Shona family. Soapstone is a talc-schist, which is a type of metamorphic rock. It is largely composed of the mineral talc, thus is rich in magnesium. It is produced by dynamothermal metamorphism and metasomatism, which occur in the zones where tectonic plates are subducted, changing rocks by heat and pressure, with influx of fluids, but without melting. It has been a medium for carving for thousands of years. Shona (chiShona) is the most widely spoken Bantu language as a first language and is native to the Shona people of Zimbabwe. The term is also used to identify peoples who speak one of the Central Shona varieties: Zezuru, Karanga, Manyika and, Korekore and Budya. Based on Clement Doke's 1931 report, Union Shona or Standard Shona was developed from the Central Shona varieties. Because of the presence of the capital city in the Zezuru region, that variety has come to dominate in Standard Shona. Mwari is the Supreme Creator in the shona contextual meaning Shona including the Kalanga. Mwari refers to the supreme Deity who created all things and it is believed that he is the author of all things and all life and all is in him. The same is applied and also referred to as Inkhosi in Northern and Southern Ndebele, and it is this deity that is worshiped in the traditional religion known as African Traditional Religion wereby people worshiped through the ancestors via Spirit Mediums who were believed to be inspired by the spirits of truth which were believed to connect to the deity to deliver messages and divine guidance. The majority of this Deity's followers are concentrated in Mozambique, South Africa, and Zimbabwe. Mwari is an omnipotent being, who rules over spirits and is the Supreme God of the religion. Each one, including its plinth, had been hewn out of a solid block of stone and measured 4 feet 6 inches in height; and each was set firmly into the ground. There was also a stone shaped like a millstone and about 18 inches in diameter, with a number of figures carved in the border. An assegai or assagai is a pole weapon used for throwing, usually a light spear or javelin made of wood and pointed with iron or fire-hardened tip. Cecil John Rhodes was a British businessman, mining magnate and politician in southern Africa who served as Prime Minister of the Cape Colony from 1890 to 1896. An ardent believer in British imperialism, Rhodes and his British South Africa Company founded the southern African territory of Rhodesia, which the company named after him in 1895. South Africa's Rhodes University is also named after him. Rhodes set up the provisions of the Rhodes Scholarship, which is funded by his estate. He also put much effort towards his vision of a Cape to Cairo Railway through British territory. Cape Town is the oldest city in South Africa, colloquially named the Mother City. It is the legislative capital of South Africa and primate city of the Western Cape province. It forms part of the City of Cape Town metropolitan municipality. Groote Schuur is an estate in Cape Town, South Africa. In 1657, the estate was owned by the Dutch East India Company which used it partly as a granary. Later, the farm and farmhouse was sold into private hands. In 1878, Groote Schuur was bought by Hester Anna van der Byl of the prominent Van Der Byl / Coetsee family. In 1891 Cecil Rhodes leased it from her. He later bought it from her in 1893 for £60 000, and had it converted and refurbished by the architect Sir Herbert Baker. The Cape Dutch building, located in Rondebosch, on the slopes of Devil's Peak, the outlying shoulder of Table Mountain, was originally part of the Dutch East India Company's granary constructed in the seventeenth century. The Zimbabwe bird has been a symbol of Zimbabwe and its predecessor states since 1924. The crest of Southern Rhodesia's coat of arms incorporated the Zimbabwe bird, and over time the bird became a widespread symbol of the colony. The paper money and coins of the Federation of Rhodesia and Nyasaland, issued by the Bank of Rhodesia and Nyasaland also displayed the bird, as did the Flag of Rhodesia. The flag and state symbols of modern Zimbabwe continue to feature the Zimbabwe Bird. It is now the definitive icon of independent Zimbabwe with Matenga (2001)  listing over 100 state, corporate and sporting organisations which incorporate the Bird in their emblems and logos. National flag of Zimbabwe containing the Zimbabwe Bird. Flag of Zimbabwe Rhodesia (1979-1980). 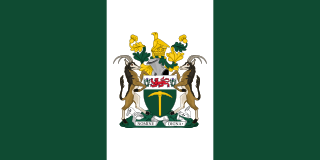 Coat of Arms of Rhodesia (1924-1982). Emblem used by the Rhodesia Corps of Signals (1970-1980). Logo used by the Parliament of Rhodesia. Rhodesian Grand Commander of the Legion of Merit (GCLM) medal (Civil and Military). Obverse of a Rhodesian 20c coin. Reverse side of a Zimbabwean one dollar coin. Reverse side of a Zimbabwe fifty dollar note (2nd series) illustrating the Great Zimbabwe Ruins and Zimbabwe Bird in the bottom right hand corner. Coat of Arms of Zimbabwe (1982- ). Zimbabwe Passport Cover (1st version) (1980). Flag of the Zimbabwe National Army. Emblem of the Zimbabwe Prison Service. Flag of the Air Force of Zimbabwe. Air Force of Zimbabwe Chief of Staff Car and Aircraft car flag. Flag of Harare, capital of Zimbabwe. ↑ Thomas N. Huffman (1985). "The Soapstone Birds from Great Zimbabwe". African Arts. 18 (3): 68–73, 99–100. JSTOR 3336358. ↑ Paul Sinclair (2001). "Review: The Soapstone Birds of Great Zimbabwe Symbols of a Nation by Edward Matenga". The South African Archaeological Bulletin. 56 (173/174): 105–106. JSTOR 3889033. ↑ Edward Matenga (2001). "The Soapstone Birds of Great Zimbabwe". Studies in Global Archaeology. 16: 1–261. ↑ Hall, Martin; Stefoff, Rebecca (2006). Great Zimbabwe. Oxford University Press, USA. p. 30. ISBN 978-0-19-515773-4. 1 2 3 Murray, Paul; Briggs, Philip (2016). Zimbabwe. Bradt Travel Guides. p. 203. ISBN 978-1-78477-016-7. ↑ Fontein, Joost (2016). The Silence of Great Zimbabwe: Contested Landscapes and the Power of Heritage. Routledge. p. 99. ISBN 978-1-315-41720-2. 1 2 Brown-Lowe, Robin (2003). The Lost City of Solomon and Sheba: An African Mystery. History Press. p. 20. ISBN 978-0-7524-9490-6. ↑ Kuklick, Henrika (1991). "Contested Monuments: The Politics of Archeology in Southern Africa". In Stocking, George W. Colonial Situations: Essays on the Contextualization of Ethnographic Knowledge. University of Wisconsin Press. p. 135. ISBN 978-0-299-13123-4. 1 2 "Zimbabwe bird 'flies' home"". BBC News. 4 May 2003. Retrieved 6 May 2013. ↑ Lhote, Henri (1963). Vanished Civilizations of the Ancient World. McGraw-Hill. p. 44. ↑ Bent, James Theodore (1895). The Ruined Cities of Mashonaland. Longmans & Company. p. 180. ↑ Maylam, Paul (2005). The Cult of Rhodes: Remembering an Imperialist in Africa. New Africa Books. p. 85. ISBN 978-0-86486-684-4. ↑ Munyaradzi, Mawere,; Henry, Chiwaura, (2015). African Museums in the Making: Reflections on the Politics of Material and Public Culture in Zimbabwe. Langaa RPCIG. p. 128. ISBN 978-9956-792-82-5. Wikimedia Commons has media related to Zimbabwe Bird . Great Zimbabwe is a city, now in ruins, in the south-eastern hills of Zimbabwe near Lake Mutirikwe and the town of Masvingo. It was the capital of the Kingdom of Zimbabwe during the country's Late Iron Age. Construction on the monument began in the 11th century and continued until the 15th century. The edifices were erected by the ancestral Shona. The stone city spans an area of 7.22 square kilometres which, at its peak, could have housed up to 18,000 people. It is recognised as a World Heritage site by UNESCO. "Ishe Komborera Africa", also called "Ishe Komborera Zimbabwe", was the Zimbabwean national anthem from 1980 to 1994. It was the country's first national anthem after gaining independence in 1980. It is a translation of 19th-century South African schoolteacher Enoch Sontonga's popular African hymn "Nkosi Sikelel' iAfrika" into Zimbabwe's native Shona and Ndebele languages. Zimbabwe Rhodesia was an unrecognised state that existed from 1 June 1979 to 12 December 1979. Zimbabwe Rhodesia was preceded by an unrecognised republic named Rhodesia and was briefly followed by the re-established British colony of Southern Rhodesia, which according to British constitutional theory had remained the proper government after Unilateral Declaration of Independence (UDI) in 1965. About three months later, the re-established colony of Southern Rhodesia was granted internationally recognised independence as the Republic of Zimbabwe. "Rise, O Voices of Rhodesia" was the national anthem of the unrecognised state of Rhodesia and Zimbabwe Rhodesia between 1974 and 1979. The tune was that of "Ode to Joy", the Fourth Movement from Ludwig van Beethoven's Ninth Symphony, which had been adopted as the official European continental anthem by the Council of Europe in 1972. The music used in Rhodesia was an original sixteen-bar arrangement by Captain Ken MacDonald, the bandmaster of the Rhodesian African Rifles. A national competition was organised by the government to find an appropriate set of lyrics to match the chosen tune, and won by Mary Bloom of Gwelo. The national flag of Zimbabwe consists of seven even horizontal stripes of green, gold, red and black with a white triangle containing a red 5-pointed star with a Zimbabwe Bird. The present design was adopted on 18 April 1980, when Zimbabwe won its independence from the United Kingdom. The soapstone bird featured on the flag represents a statuette of a bird found at the ruins of Great Zimbabwe. The bird symbolises the history of Zimbabwe; the red star beneath it officially stands for the nation's aspirations but is commonly thought to symbolise socialism, and the revolutionary struggle for freedom and peace. The design is based on the flag of Zimbabwe's ruling party, the Zimbabwe African National Union – Patriotic Front. Chimurenga is a word in the Shona language, roughly meaning "revolutionary struggle". In specific historical terms, it also refers to the Ndebele and Shona insurrections against administration by the British South Africa Company during the late 1890s—the Second Matabele War, or First Chimurenga—and the war fought between African nationalist guerrillas and the predominantly white Rhodesian government during the 1960s and 1970s—the Rhodesian Bush War, or Second Chimurenga. The current coat of arms of Zimbabwe was adopted on 21 September 1981, one year and five months after the national flag was adopted. Previously the coat of arms of Zimbabwe was identical to the former Coat of arms of Rhodesia. The eagle is used in heraldry as a charge, as a supporter, and as a crest. The eagle with its keen eyes symbolized perspicacity, courage, strength and immortality, but is also considered "king of the skies" and messenger of the highest gods. With these attributed qualities the eagle became a symbol of power and strength in Ancient Rome. It has been connected by the Greeks with the god Zeus, by the Romans with Jupiter, by the Germanic tribes with Odin, by the Judeo-Christian scriptures with those who hope in God, and in Christian art with Saint John the Evangelist. Nicholas Mukomberanwa was a Zimbabwean sculptor and art teacher. He was among the most famous products of the Workshop School at the National Gallery of Zimbabwe and an art mentor and teacher to the Mukomberanwa Family of sculptors. His work has been exhibited in galleries around the world and he remains one of Zimbabwe's most famous artists. Joram Mariga has been called the “Father of Zimbabwean Sculpture” because of his influence on the local artistic community starting in the 1950s and continuing until his death in 2000. The sculptural movement of which he was part is usually referred to as “Shona sculpture”, although some of its recognised members are not ethnically Shona. John Takawira was a Zimbabwean sculptor. The background to the sculptural movement of which he was a leading member is given in the article on Shona art. Henry Munyaradzi was a Zimbabwean sculptor. The sculptural movement of which he was part is usually referred to as "Shona sculpture", although some of its recognised members are not ethnically Shona. He worked initially at the Tengenenge Sculpture Community, 150 km north of Harare near Guruve, which he joined in 1967. In that Community, and ultimately in the wider world of lovers of Zimbabwean art, he was known simply as 'Henry'. The pre-colonial history of Zimbabwe lasted until the British government granted colonial status to Southern Rhodesia in 1923. Zimbabwean art includes decorative esthetics applied to many aspects of life, including art objects as such, utilitarian objects, objects used in religion, warfare, in propaganda, and in many other spheres. Within this broad arena, Zimbabwe has several identifiable categories of art. It is a hallmark of African cultures in general that art touches many aspects of life, and most tribes have a vigorous and often recognisable canon of styles and a great range of art-worked objects. These can include masks, drums, textile decoration, beadwork, carving, sculpture, ceramic in various forms, housing and the person themselves. Decoration of the body in permanent ways such as scarification or tattoo or impermanently as in painting the body for a ceremony is a common feature of African cultures. Stone sculpture is an art for which Zimbabwe is well known around the world. The flag of Southern Rhodesia was a blue ensign, later changed to a sky-blue ensign, with the coat of arms of Southern Rhodesia on it. The flag was in use in Southern Rhodesia from 1923 to 1953 and from 1964 to 1965. It was also used by the unrecognised Rhodesia from 1965 to 1968. The flag was initially used unofficially internally before being approved for use outside of the colony by the Colonial Office in 1937. The colour was changed to sky blue in 1964 to protest the treatment of Southern Rhodesia after its inclusion in the failed Federation of Rhodesia and Nyasaland. Jan Adam Render was a German-American hunter, prospector and trader in southern Africa who is generally recorded as the first white man to see the ancient city of Great Zimbabwe, having inadvertently come across the ruins while hunting big game in 1867. He subsequently guided the explorer and geographer Karl Mauch during the first archaeological expedition to the site in 1871, and also discovered prehistoric gold mines in the region. Edward J. Matenga is a Zimbabwean archaeologist and the former director of the Great Zimbabwe World Heritage Site. He is now an independent consultant and a member of the International Council on Monuments and Sites (ICOMOS).